Now you can cook like a chef! COOKINA CUISINE NON-STICK AND REUSABLE BAKING SHEETS make sure everything glides and nothing sticks thanks to a revolutionary material. COOKINA CUISINE NON-STICK AND REUSABLE BAKING SHEETS look like a sheet of plastic except that they are heat resistant and wont burn. Their non-stick quality allows you to cook your food to perfection without using oils or sprays to grease the surface. Once you have finished cooking, you only need to wipe it clean or wash it in warm soapy water with the convenient scour pad included. Your oven and pans will stay new and sparkling ! COOKINA CUISINE hold no odor or flavor from previous use, so you can cook fish, wipe your COOKINA then bake cookies in the same spot. Great alternative to aluminum foil, parchment and wax papers ! Ideal for cookies, pies, cakes, biscuits, breads, baked goods, nachos, pizzas, fish, chicken, roasts, casseroles and even eggs in a pan. Makes a great non-stick surface for breads and candies. Never clean the bottom of your oven again ! COOKINA GARD OVEN PROTECTOR catches messy spills and splatters and makes sure that you never have to clean the bottom of your oven again thanks to a revolutionary material. COOKINA GARD OVEN PROTECTOR looks like a sheet of plastic except that it is heat resistant and wont burn. Made to resist temperatures up to 550F, it is made with a 100% non-stick material that is easy to clean. You only need to wipe it clean or wash it in warm soapy water using the convenient scour pad included. Its ready to be used again. Alternative to aluminum foil, it holds no odor. Fits any size oven; can be cut to desired size. Suitable for gas ovens, electric ovens, and microwaves. It is reversible, and reusable. Without hard work COOKINA GARD OVEN PROTECTOR will keep your oven new and sparkling ! PARCHMINUM is more than a simple trademark or another non-stick cooking sheet; it looks like aluminum foil and can be used like aluminum foil or parchment and wax paper. Use PARCHMINUM in the oven and the microwave, then transfer it to your serving dish. PARCHMINUM will enhance the presentation of your meals ! PARCHMINUM is also a technology that results in a product that is thinner providing a better heat transfer; delivers a higher non-stick performance; is easier to clean; can be safely used with metal utensils. Made to resist temperatures up to 550F ! Seasoning is simply oil baked into the iron, giving you a natural, easy-release finish that will improve with each use. Dishwashers, metal scouring pads, and harsh detergents can harm the finish. If this happens, you can revive your seasoning. Be sure to lift your pan when moving it on a glass top stove. Use any utensils you like, even metal. Heat and cool your pan gradually for added longevity. No microware. 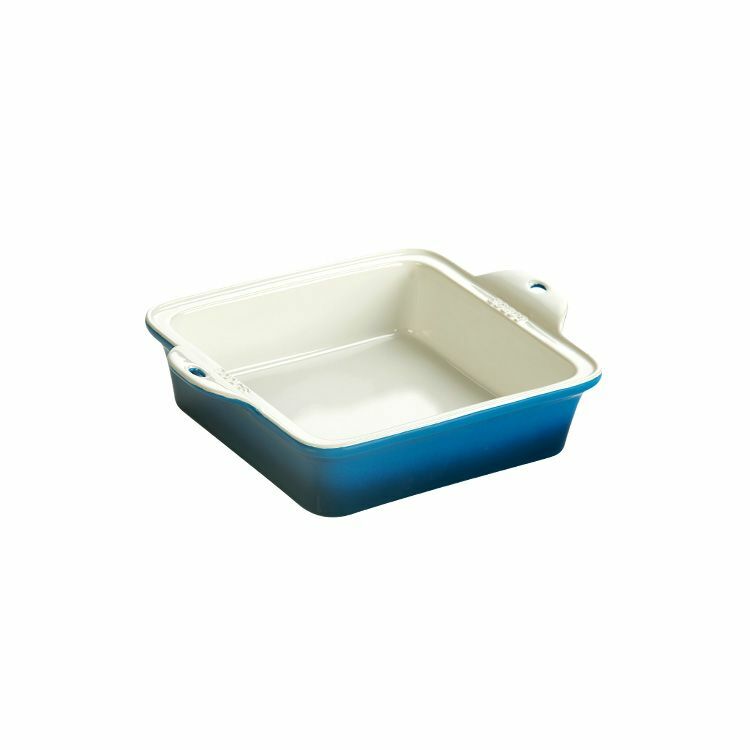 Stoneware Baking Dish 8X8 inch Blue Lodge's centry-old tradition of excellence continues in our beautiful and durable family of ceramic stoneware. Molded out of natural clay, these elegant pieces are fired at high temperatures and then glazed with vibrant colours for a lifetime of better baking and stylish serving.